A datamart is a repository designed to hold data specific to a given business purpose. This is done by merging disparate databases into one central location, allowing greater visibility and better business insights. WHAT IS A DATAMART, AND HOW ARE THEY DEVELOPED? 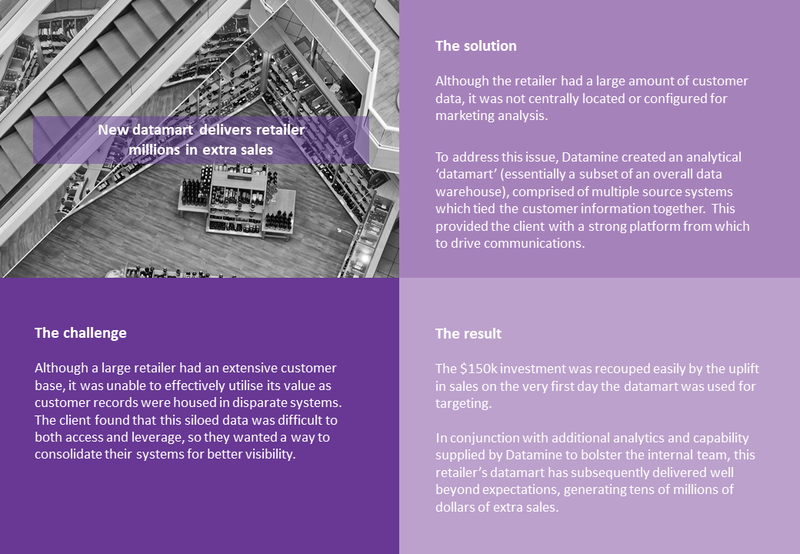 Datamarts are developed and implemented to make it easier for clients get better value from their data. They are smaller and more unique to a specific department or business endeavour than a data warehouse. By combining different databases into one smaller repository, organisations can understand a person’s total relationship with their company, and their current and potential value. To get an even better picture, relevant external data like Census and Quotable Value data and/or attitudinal research data can be appended. Datamarts are fully customisable and can either be installed in-house or hosted externally at Datamine. The data is regularly refreshed and cleaned (daily, weekly or monthly) to provide up-to-date, current and accurate data, which organisations can use to easily track and report on the success of different initiatives in order to develop a continuous learning and improvement culture. Having a datamart with clean and accessible data also makes it much easier for Datamine to work on other analytics projects for the client, as the project delivery timeframe is expedited. Who are the 'users' for this datamart? Marketing? Product? Risk? IT? All of the above? What is the purpose of the datamart? Analytics only? Or will campaign lists be required? What data sets are available and what format? Who 'owns' these data sets within the business? How and how often are they updated and how often can Datamine receive a refresh? What cleaning and processing will be required, e.g. address cleaning? Name cleaning? Email pinging? Is a Single Customer View (SCV) a development requirement at this stage? Or later? Who will host the datamart? Datamine or the client? 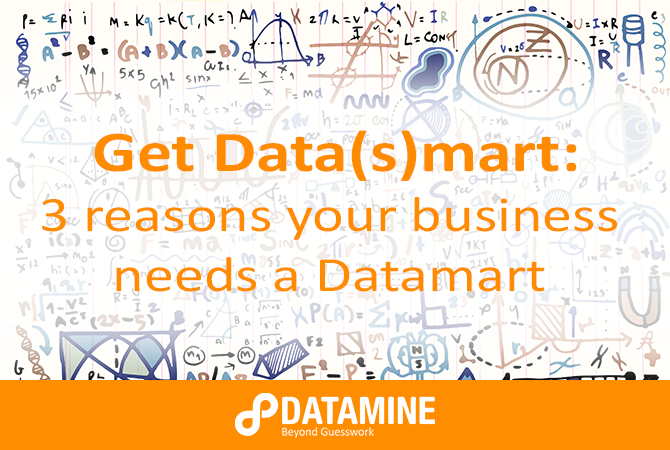 Interested in learning more about how Datamine could help you develop and implement a datamart? Fill out the form below to schedule a call with us.